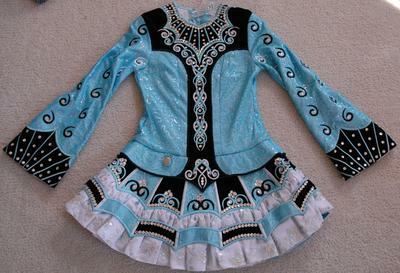 Classy Siopa Rince solo dress, made for the 2009 North American Nationals. Made of black velvet and blue satin with a sequin overlay, many 100s of swarovski crystals, this dress really sparkles on stage. 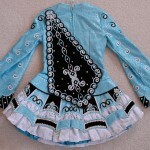 We are the second owner of this dress. It has been well-maintained, being aired out after each use, missing crystals replaced, etc. Stored flat in a smoke-free home. Included in the sale are 4 headbands (one tiara backing, 2 hard headbands, and one softer headband, used when my dd doesn’t wear a wig), cape, 2 pairs of bloomers, and a handy dress cover that keeps the sequin fabric from snagging on itself. 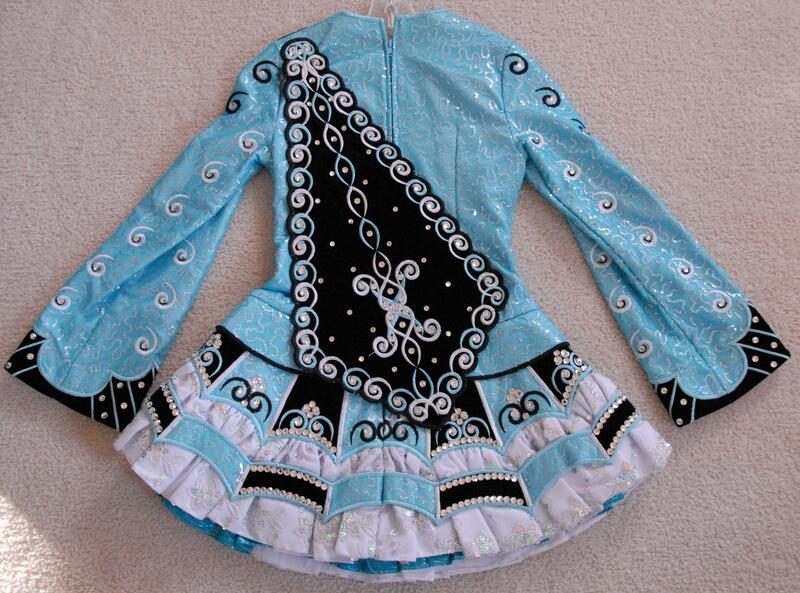 We had initially altered this dress to fit my dd when she was about 4′9″ or so and more slender. Asking $800USD or nearest offer. Shipping within the US included, overseas extra. Will allow for return of dress within 5 days of receipt, buyer to pay all shipping costs and dress to be returned in the same condition it was sent. Can be taken in/up. No let down available, some let out available. I have sewn snaps on the inside of the sleeves to shorten the length to 21.5, to keep a crease from forming since my dd’s arms aren’t as long as the original owners. Asking Price: $US750 or nearest offer. Shipping costs are included for my own country, overseas shipping is extra. Will accept returns and refund the cost of the dress, buyer to pay all shipping costs.